Neuroblastoma has a ‘high-risk’ form which, despite using every treatment available, means that some children can’t be cured. Some of these tumours have extra copies of the MYCN gene, and this could be important. So Dr Helen will be testing the effects of a new drug that we already use against ovarian cancer, and other similar drugs, on MYCN neuroblastoma. What we learn may help us develop new treatments quite quickly. This project is looking at MYCN neuroblastoma to discover whether drugs that are already treating other types of cancer will be effective against it. It could quite quickly result in treatments that save the lives of more children. Neuroblastoma is a type of children’s cancer that affects specialised nerve cells, usually in the abdomen. It’s one of the most common cancers to affect children, with around 100 new cases every year in the UK. Nearly half of all children diagnosed with neuroblastoma have ‘high-risk’ disease. Often, their cancer has extra copies of a gene called MYCN, and treatment includes intensive chemotherapy, radiotherapy and surgery. Developing new treatments will help us to save the lives of many of these children. We know quite a lot about what MYCN does, but we still know little about its effects on the way that DNA repairs itself. Every cell in the human body, including in cancer, contains DNA, and cells can’t survive without it. DNA is constantly being damaged and our bodies have developed efficient ways to repair it. We know that in certain types of cancer DNA is not repaired properly. Dr Bryant believes that this may be the case in neuroblastoma, possibly due to MYCN, and that this could be the key to developing treatments that work better and have fewer side-effects. This project could really help children with neuroblastoma. This cancer is responsible for up to 15 per cent of childhood cancer deaths and current treatment has many short- and long-term side-effects. So we urgently need new treatments. Cancers like MYCN Neuroblastoma can be killed by some drugs that also affect the way in which DNA is repaired. The most famous example of this type of drug is called Olaparib. 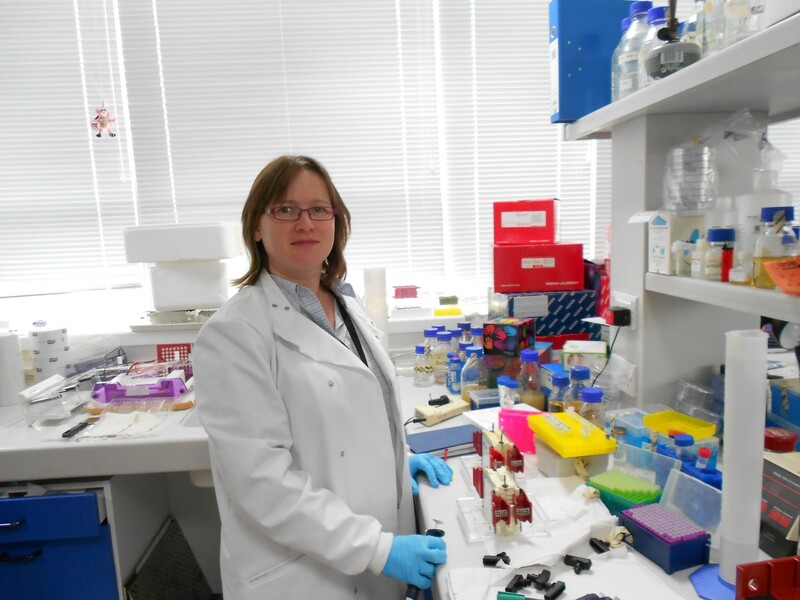 This drug, which was developed in Dr Helen’s laboratory, has been recently approved for women with ovarian cancer and is already saving lives. There is already evidence that Olaparib might work in MYCN neuroblastoma. The team want to analyse the effects of Olaparib and other drugs in neuroblastoma cells in the laboratory, to work out how it kills them. If they can show that these drugs kills neuroblastoma, we should be able to test them on children with the disease quite quickly. We’ll also learn more about how neuroblastoma cells are cancerous and how cancer genes affect the way in which DNA is repaired. This may lead to new treatments for other types of cancer in the future. This funding will also provide vital research training for Dr David King. It’s important that we keep training new academic paediatric oncologists so that there is a new generation of experts working towards our ultimate goal of curing all childhood cancers. Dr Helen Bryant will lead an experienced team of researchers at the University of Sheffield. The scientists and clinicians will help explore and translate findings from the laboratory bench to a treatment for a child with cancer. Dr Helen has over 20 years’ experience of researching cancer. Her work has led to a number of important discoveries, including more effective treatments for breast cancer. Dr David King is a children’s doctor employed by the University of Sheffield as a clinical lecturer in paediatrics. Dr Daniel Yeomanson is a paediatric oncologist at Sheffield Children’s Hospital whose clinical expertise will help children with neuroblastoma benefit from this work as soon as possible.